For other places with the same name, see Saint John (disambiguation). VC Bird International Airport is situated a few kilometers away, and has regular flights to UK, U.S., Canada, and other Caribbean islands. Many tourists arrive by Cruise ship to spend the day. Most ships dock at large piers that empty into downtown through an open-air shopping mall. Bike Plus (Independence Dr, St John’s, Tel: 462-2453, www.bikeplusantigua.com) rents out a range of bikes from US$ 17.50 per day (Year 2010). Carnival - annual festival from late July to early August. 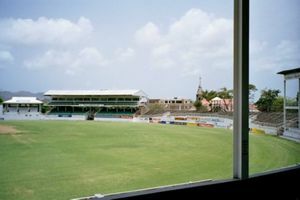 Cricket - Antigua's big sport. Played at the Recreation Ground, matches are accompanied by calypso music and mass dancing! Sample local cuisine and drinks. Mingle with the locals and don't be afraid to ask directions. Gamble if you're into that. Go to one of the many clubs and I mean Many! See this topic under "Antigua". Clothes many clothing stores exist. Memorabilia like T-shirts, ornaments etc. from the vendors. Many restaurants exist in the St. John's area. And Bars are littered around the island. Ask for your favourite beer and they will most likely have it. While in town, be wary of casino scams. The Keno Palace Casino on St. James street runs a variation on the "Razzle Dazzle" game in which a woman will try to lure you in to the Casino with the promise of free bets. The game they bring you to involves pulling balls out of a hopper, with the ultimate goal being to tally a score over 100. You'll appear to be doing quite well at first, and will be enticed to bet real money to chase the cash pot. Before you know it, you may be out hundreds of dollars chasing a prize that you'll never win. Avoid this scam at all costs. At one of the many hotels or guest houses. For the traveller on a budget try to stay at a local rented apartment or a cheap motel. Jumby Bay, PO Box 243, St. John’s, Tel (268) 462-6000, . This Caribbean luxury resort in Antigua offers suites and villa accommodations, afternoon tea, tennis instruction, beauty and massage services, and meeting space and wedding facilities. This page was last edited on 12 September 2018, at 13:06.